Thanks to the latest issue of The Man And His Music, the best Elvis magazine around, I learned of a rare clip of Elvis leaving his hotel in Louisville, Kentucky, on June 26, 1974. According to a letter from a guy living in The Netherlands, the local TV station, WHAS 11, filmed and interviewed fans before Elvis' performance at the Freedom Hall. The station also captured Elvis coming out of his hotel as he was leaving for the arena. 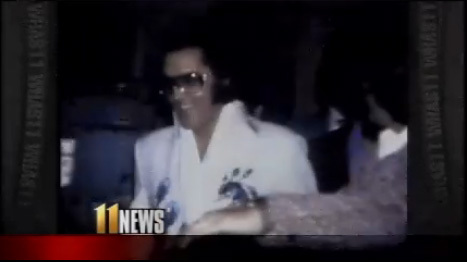 I immediately sat down at my computer, goggled for "WHAS 11 Elvis" and found both Vintage Elvis footage as well as Friday Flashback: Elvis plays Louisville on the station's website. The latter is a news feature (running 3:13) that was broadcast on January 8 this year, honoring Elvis' 75th birthday, and the former includes bonus footage (nearly 28 minutes of it). Both features the clip of Elvis leaving his hotel, wearing the Peacock jumpsuit and looking great as he laughs at some fans and then gets into his limousine. "Quick shot there, but we got it," a smiling news anchor announces afterwards. And another thing: The news feature also includes footage from Elvis playing in Louisville at the Armory in November 1956. Although silent, it shows the impact of his show and the arena packed with people. Pure magic!